This entry was posted in Apps and Applications, Coding and Robotics, iPads, Professional Development, Valuable Web Resources on December 3, 2018 by Lisa Suhr. This entry was posted in Apps and Applications, General Discussion, iPads, Productivity, Professional Development, Valuable Web Resources on July 14, 2018 by Lisa Suhr. Hope you find something valuable from this week’s video highlighting five of my favorite educational resources!! This entry was posted in Apps and Applications, iPads, Personal Learning Networks, Productivity, Professional Development, Valuable Web Resources on June 22, 2018 by Lisa Suhr. This summer I offered an option to our district staff to receive a weekly video I’ve been making called y Friday Favs. In each video I share an educational resource that is one of my favorites that I think other people may like, but maybe they aren’t a broad enough topic to offer an entire training on. Sometimes they are web resources, apps, books, activities, tech skills, or ways to save time so you can learn more about technology! I have about 35 people signed up to get the videos delivered via email, and a couple have said I need to be sharing them on my blog and elsewhere. So I’m going to share the first 4 episodes here and for the rest of the summer, I’ll post each as its own blog post. This entry was posted in General Discussion, Professional Development, Valuable Web Resources on June 15, 2018 by Lisa Suhr. Summer is a great time to refresh and recharge with a little staff development. Here’s what I’m offering this summer for the teachers in my district! This entry was posted in Find Time for Tech, GAFE, iPads, Make Time for Tech, Personal Learning Networks, Productivity, Professional Development on May 30, 2018 by Lisa Suhr. Time for a little end of the year housekeeping lesson. If you’re a Google Classroom user, at the end of the year please consider archiving your classes. This helps keep your teacher account cleaned up AND even more importantly, keeps students’ accounts (including shared calendars) cleaned up for the future when they log in to Google Classroom! Here’s a short video I made while archiving my own classes this spring. 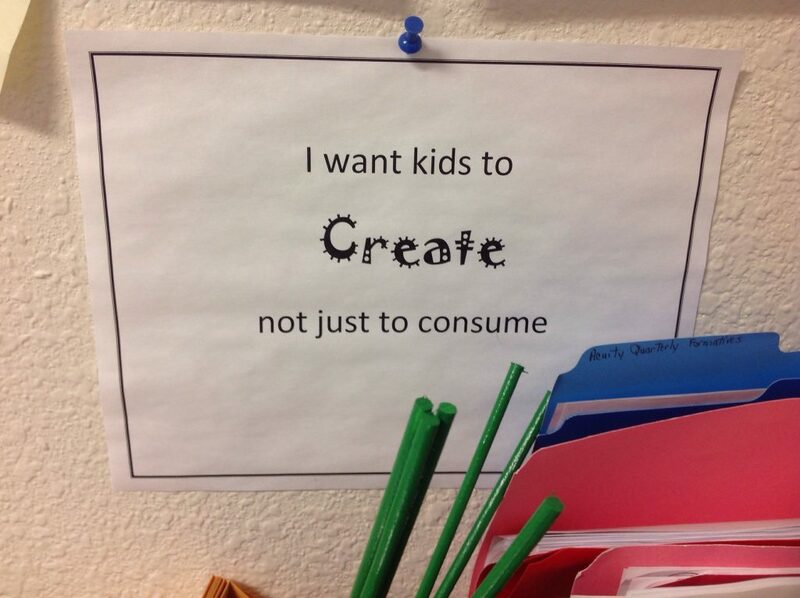 This entry was posted in Classroom Management, GAFE, Productivity on May 11, 2018 by Lisa Suhr. I recently heard about and then checked out a new handy little web-based tool I thought I’d do a quick blog post about. ClassroomScreen is a website you visit in your browser that has several handy built-in tool options I think many teachers would find valuable. So for the rest of this post imagine having ClassroomScreen open with your computer hooked up to a projector and the image being displayed for your entire class! Of first note is that the background images that are available: they are beautiful and soothing. Of course you can upload your own photographs and share those beautiful vacation pictures if you’d prefer! So much more focused than a busy computer desktop with hundreds of icons. Language: You can display the words for this tool in your choice of languages. Background: Select from about 35 beautiful images or upload your own. Random name generator and dice: Add your class list and you’ll always have a way to quickly select a student at random. Sound level: This tool allows you to use the laptop’s microphone to measure sound in the room and the represent it visually so students can tell when they are getting too loud. 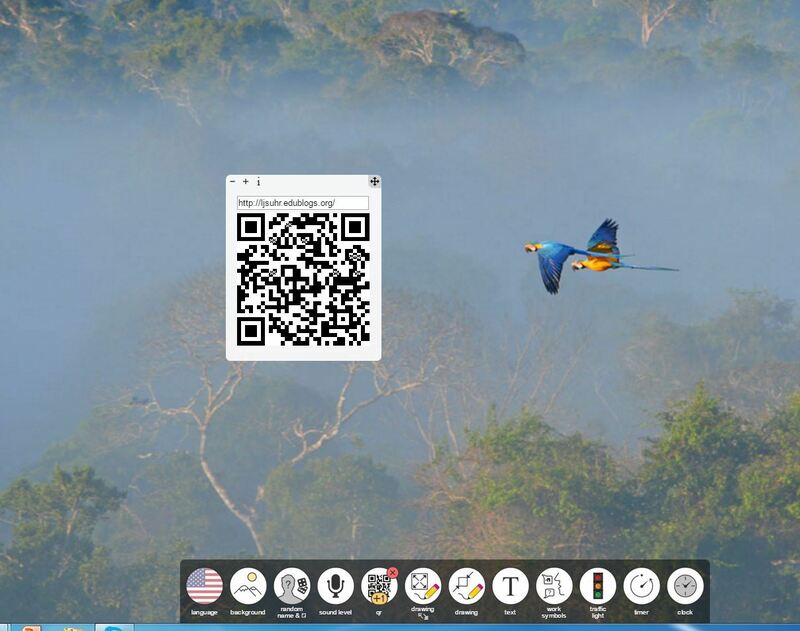 QR Tool: A handy little window you can pop open, paste in a website and generate an immediate QR code you can have your class scan to quickly visit the site you’re wanting. Full Screen Drawing Window: Simple pens of a variety of colors and paper background options…including the option of graph paper. Small Screen Drawing Window: A smaller window with fewer options. Work Symbols: Visual reminders to students about what type of work should be going on at any one time. Included are: silence, whisper, ask neighbor, and work together. Timer: A visual timer that counts down from the time you give it. Notice in the picture below, you can have multiple timers for various groups that may be working in your class or various reminders you may set for yourself. You can also set this to a stopwatch feature to have it count increasing time. Clock: Simple display of the current time. Multiple tools can be open and in use on the screen at the same time. Just drag them around for an arrangement that makes the best sense to you! A few more screenshots follow this post, but the best way to learn about ClassroomScreen.com is to follow the link and try out the tools for yourself! Let me know if you find it valuable! 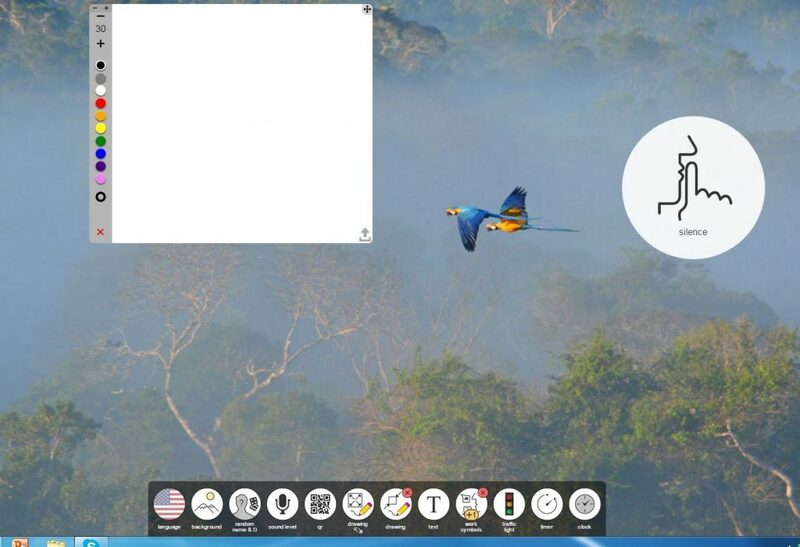 The drawing window and example of a “work symbol” from classroomscreen.com. Example of a quickly-made QR code at classroomscreen.com. This entry was posted in Classroom Management, Find Time for Tech, Productivity, Valuable Web Resources on February 6, 2018 by Lisa Suhr. Greenscreen Technology: Learn and Earn! This entry was posted in Apps and Applications, iPads, Professional Development on January 31, 2018 by Lisa Suhr. This was the “teaser” photo I sent out to teachers letting them know I had some exciting opportunities coming for them! A few had come to some optional summer training I had offered, but most had no experience! 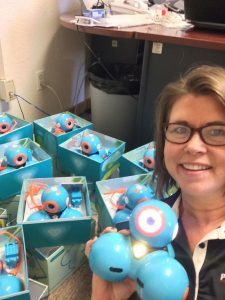 During the 17-18 school year, I’ve had the good fortune to get to work with several K-12 students in USD 113 using Dash and Dot Robots by Wonder Workshop. This is the first in a series of posts that are reflections on what I’ve learned and how I hope our district moves forward. Last spring I got permission to order a single Dash and Dot set to evaluate because I’d seen them at a couple of technology conferences and wanted to try for myself to see if they’d work as well as my first impression. I loved them! A middle school student who was job-shadowing with us spent a little time experimenting an giving input, too. I had a colleague with another set, so I used the robots once last spring for about 40 minutes with each of the 4th grade kids in some small groups. They just got a taste, but I was hooked as I watched the student enthusiasm, engagement, problem solving and collaboration skyrocket! So far at this point, all 4 first grade classes in our three elementary schools have had about 8 sessions learning with the Dash robots through explicit instruction, experimentation and guided challenges! So I’ll also share some reflections about my experiences with first grade! The third grade classes at Sabetha Elementary School all invited me in to do a couple of 30-minute sessions with them focusing on the math concept of input-output machines. At Axtell, the Dash robots were invited to be part of their high school’s first ever Career Day as an exploratory session to encourage students to consider coding and computer science as well as other topics that our small schools may not be able to offer as formal electives. And I had a great time introducing the 3rd and 4th graders at our Wetmore school to Dash and Dot during Computer Science Education Week back in December. I meant to start reflecting in m blog much sooner, but better late than never, I guess! I hope you’ll check back to learn more in the next several days to read more about my reflections!! This entry was posted in Coding and Robotics on January 18, 2018 by Lisa Suhr. Here is a single presentation made up of all my session presentations used at the Education Summit held in Baileyville, KS on June 20, 2017. This entry was posted in Apps and Applications, Digital Citizenship on June 19, 2017 by Lisa Suhr.